The nation’s employment rolls went up 209,000 last month, and the unemployment rate ticked down slightly to 4.3%. The underlying pace of job gains, shown below, suggests a solid, healthy labor market characterized by strong employer demand for workers. 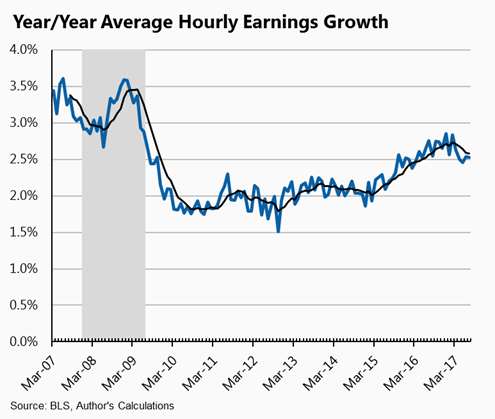 That said, wage growth remains remarkably subdued. Taken together, these two facts imply that while we’re closing in on full employment, we’re not there yet. To get at the underlying trend just mentioned, our jobs-day smoother takes some of the noise out of the jumpy monthly data by averaging job gains over 3-, 6-, and 12-month periods. 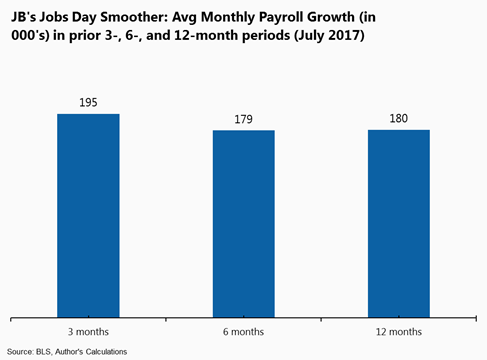 There’s been a slight acceleration of job growth over the past three months, but broadly speaking, net payrolls are rising at a rate of between 180-190 thousand over the past year. That’s strong enough job growth to continue placing downward pressure on the unemployment rate. Typically, downward pressure on unemployment means some degree of upward pressure on wage growth. 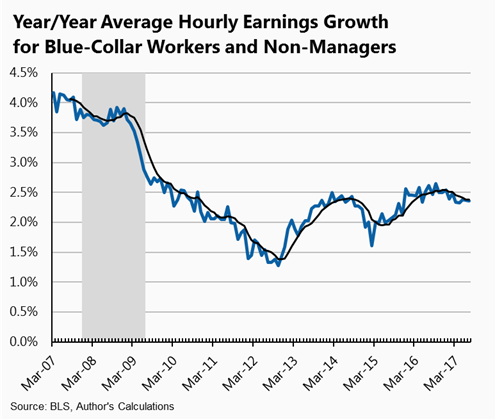 But as the next two figures reveal (average hourly wage growth, yr/yr, for all and non-supervisory—blue collar and non-managerial—workers), while nominal wage growth initially caught a buzz, rising from about 2 to around 2.5%, it’s gotten stuck at 2.5 (a bit lower for the mid-level workers) and hasn’t accelerated further even as the job market has continued to tighten. One explanation for this lack of correlation is that the job market still has some slack, and that’s suppressing the extent of worker bargaining clout that we’d historically associate with the low unemployment rate and steady, sizable monthly gains we see in these data. –Monthly job losses/gains have swung from an average monthly loss of 773,000 in the first quarter of 2009 (i.e., your worst nightmare) to an average gain of 195,000 over the last three months. –Unemployment fell from a high of 10% in Oct of 2009 to 4.3% last month. –Underemployment fell from a high of 17.1% in April of 2010 to 8.6% last month. –Involuntary part-time work has fallen from 9.2 million in September of 2010 (6.6% of employment) to 5.3 million in July (3.4% of employment), slightly down from where it was in June. –The closely watched labor force participation rate is up from a low of 62.4% in September of 2015, but only moderately, ticking from 62.8% in June to 62.9% last month, which is back to where it was at the beginning of 2017. Some of this represents aging boomers leaving the labor force, but some represents ongoing slack. –That “slack” point re labor supply is underscored by looking at the prime-age (25-54, so few retirees in there) employment rate, which climbed from a low of 74.8% in November of 2010 to a post-recession high of 78.7% this month (up from 78.5% last month); it is now over 70% of the way back to its January 2007 level, 80.3%. So, clear evidence of labor market tightening, but, at least as far as the prime-age workers go, still some potential labor supply to be tapped. Sticking with the wage theme for one more moment, clearly the so-called wage Phillips Curve—the correlation between wage growth and the level of unemployment—must be very flat. The next figure takes a little work to absorb but it’s really worth it, IMHO (h/t to its creator, Ben S!). The figure plots unemployment against the annual change in average hourly earnings for blue-collar and non-managerial workers, basically mid-level earners (each data point represents a different month). During the 1990s recovery, a period of chock full employment when real wages grew solidly across the pay scale, you clearly see the expected negative slope. But in this recovery, it’s flat as a pancake. As I said, that’s partly remaining slack, but there are other factors in play. One hypothesis is that the combination of high inequality and low productivity is part of the problem. Productivity growth is much slower now than in the latter 1990s, when wages were more responsive to labor market tautness. That meant employers could provide wage gains and still maintain their profit margins. With output per hour growing more slowly, in tandem with worker bargaining power that’s still too weak, employers are keeping profit margins up and holding down the growth of pay packets. I’ll have more to say about the sectoral job changes in July later—running off to play some chin music on MSNBC around 10:30. Manufacturing employment is up a touch in recent months—28K jobs over the past two months—possibly reflecting the benefits to the sector of the falling dollar, though it’s too soon to tell if this is a new, improved trend. Finally, need I say, I strongly recommend you assiduously ignore any president who argues that his awesomeness is behind these job gains (though he’d be far from the first to claim such credit). This momentum was fully in place before Trump got here, and the best I can say for him is that he hasn’t screwed it up…yet. Share the post "Jobs day! More solid jobs gains…but wage growth still not responding"
12 comments in reply to "Jobs day! More solid jobs gains…but wage growth still not responding"
And when, not if, the President does claim credit for these numbers, I’d like to know what changes he instituted at the BLS that makes these unemployment numbers now correct compared to during the campaign when he claimed they were fake and the real unemployment number was much higher. Thanks for the analysis. It is probably a little of all of the above. But maybe these two factors, too: (1) lack of labor bargaining power, and (2) diminished expectations. 3-d graphs are hard to draw, but envision one with these three axes: supply of labor, demand for labor, and labor bargaining power. Even if supply and demand require higher wages to clear, lower power will prevent it. We are a generation into a stagnant wage environment, and past experience guides future expectations. Neither management or labor expects wages to rise because everyone knows that wages don’t rise. And so they don’t. An anecdote – Amazon has been running TV ads for workers to fill jobs at distribution hub opened a year or two ago in Shakopee, MN. Your “Jaws of the Snake” diagram showed that the posited, theoretical relationship between wage gains and productivity broke down (or was overwhelmed by something else – a reversal of trends in immigration?) over 40 years ago. Have you re-examined that relationship recently? Besides, if labor remains cheap, do employers have the same incentive to spend additional bucks on cutting labor inputs? If they don’t, then that would be a drag on productivity. Because if this relationship has broken down, why are we worrying about it? And if you go by anecdotes, there are lots of highly skilled people being forced into early retirement just because there are cheaper, younger workers available. (Why pay extra for skills and experience if they aren’t cute?) And there are still lots of young, unskilled kids unable to find jobs. If we go by Occam’s razor, the best explanation for low wage growth is just that there are far too many involuntarily unemployed workers who are not included in the measured unemployment rates. Either say the 2.5% is nominal or give only the real gain after inflation. It’s less than helpful not to cite real gain or note very low inflation anyway. The one percent prime age labor force market dropouts represent ovet a million people. Would it kill you to add these numbers to your text? It means unemployment including dropouts would be 5.3 % , helpful explaining wage levels, no? Finally, why no mention of where and what kinds of jobs are created. Low paying job creation also would explain stagnant wages. Are we assume the same job mix because last I looked 2/3 of all job opening required no more than high school degree. What about shortage of high skills jobs, even STEM, forcing college grads to take jobs where they displace high school grads. And the surplus of college grads suppresses wage gains in for high skills. Not that wages are controlled by supply and demand curves (see Adam Smith) when employers control means of production. But none of this is given proper attention, so flat wages are caused mysterious ether. They are not low paying jobs. The quality of job creation this cycle has been better than the 00’s and 90’s. But a lot of jobs were lost. Real wages have been growing since 2014 and yes, the natural rate of inflation on general goods have been falling since the 80’s. Jared has a point about “slack”, but even there he is trying to hard. The U-3/U-6 simply will be lower than say in the 90’s expansion because the overall cohort has shrunk since 2007(which was the shoulder to the Boomer wave). 8.6% with underemployment in 2017 won’t cut it like in 1997. It needs to shrink down to 8% and that probably represents the 9% in 1997. I see nothing that is stopping the economy filling that in over the next 6-12 months. The dollar speculation crap is over. The ECB is now boosting the value of the Euro. I see Fed balance sheet shrinkage and a good thing considering those assets need to be put back on the market. The oil bust is over and steady. Jared needs to take a chill pill and relax. I am more worried about a boom in 2018-20 causes another bust in the 2021-22 period. Who says they are not low paying jobs. BLS says otherwise. Lets look at actual data, shall we? Here is my analysis. Take all the new jobs created 2014-2024 in the top 30 list multiplied by all the median wages for each job and sum the total wages from new jobs. Divide by sum of jobs created column, and you get a $40,480 median. Unfortunately, we live in the age of inequality where a graph of income distribution looks like a children’s slide and not a normal distribution (a bell curve). Most salaries are low, with a few very high salaries raising the average median disproportionately. It’s easy to see this surveying all the salaries for the occupations on the BLS chart. But to confirm this, if you remove the top 4 (out of 33 occupations) incomes, the average median drops to $32,230. Even in the top 4, 2 occupations representing 30 percent of new high paying jobs (software developer, and computer system analyst) are filled mostly with foreign labor despite no shortage of STEM workers. The BLS chart shows 153 and 118 thousand new jobs for the those positions, which is 271,000 over ten years or 27,100 per year, while well over 100,000 new high skilled employer sponsored workers enter the workforce each year. Half of the 100,000 are I.T. workers, and half remain in the country obtaining permanent residence when their visa expires (H1B can last up to 6 years, plus extra time waiting for green card). Half of half of 100,000 equals 25,000, or nearly the total new I.T. job growth listed, but the top 30 list leaves off a few other important I.T. titles. This means there are significant numbers I.T. positions for U.S. citizens, but very significant suppression of wages caused by exploited labor who lack full labor rights, or really any labor rights. I’m highlighting I.T. because it’s a special case, because it’s large, growing, but has been so effectively targeted by industry, though retains high salaries. No one seems to grasp that wage growth even for high salaries when suppressed effects everyone (due to fluid market, and students responding to market signals, higher wages, competition for talent, but current college grad glut). The book “State of Working America” made the case that I.T. salaries (among college educated occupations) gained the most pre recession, but still only .3% per year. Again, maybe the 00s when millions of manufacturing jobs were lost, (4 million I think) is not the best benchmark to use. As for the 1990s, the late 1990s saw quicker growth, and dramatically rising inequality, both of which confounds comparison. But the current data says the quality or at least wages of most jobs are poor. 85% of top 30 with greatest number of new jobs have a median income of $32,000. Yes, that $32,000 is the new minimum in California, and metro New York, but Senate Majority Leader Schumer now is enshrining in Democratic platform’s better deal. 85% of the top 30 occupations with the most new jobs pay the proposed minimum. Does that sound like a healthy job market? For those confused because they’ve seen U.S. median incomes reported as something close to $50,000, that 50k represents household income, meaning two or more wage earners. Kind of glitch, or mistake in my description, as the drop in median wage from $43,000 for all new jobs 2014 to 2024, down to $35,000 for 81% of all new jobs in that period, means the 81% is the bottom 81% listed, not the top, obviously. Maybe you should look at wages vs economic growth instead of wages vs. unemployment. 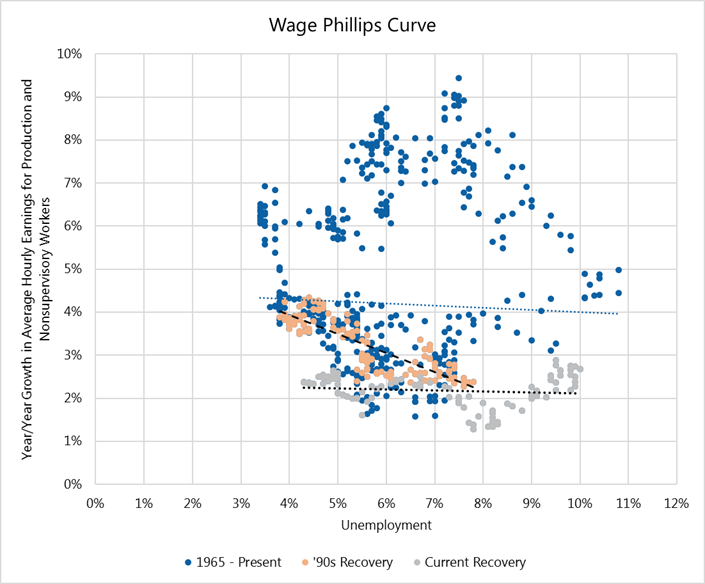 Your phillips curve presumes that wages are controlled by supply and demand curves, and that supply is reflected by unemployment rates. The missing million prime age workers means the official unemployment rate is near meaningless. Moreover, despite textbook theory, where do you get off claiming wages are controlled or even dominated by supply and demand? I”m not denying they are influential factors. But there is a a great lack of evidence that wages are really dependent on movement of two curves representing macro supply and demand for labor. And going back to my previous comment, I’ll add another factor being missed. What about inequality? If economic gains accrue mostly to the 1%, why wouldn’t the same mechanism be involved in suppressing the wages of the remaining 99%. One could note that the 1990s, the supposedly beneficial economic period, saw dramatic increases in inequality, it may be the case that only after those cumulative changes occurred, meaning after 2000, that the full impact of the increase brought a halt to expected wage gains. Also, when factories closed, moving south to southern states, Mexico, or overseas, how would that not affect wages, full employment or no full employment. I don’t see any wages dropping, but that’s been the reality for a large segment of the labor force since 2000, and before. That in itself shows a big disconnect. This neglect leads to the election of Trump. So now we will list the missing elements of your analysis. 2. Economic growth and not unemployment may be the actual driver of wage increases. 5. An overskilled workforce as effects trickle down as too many college grads competing for jobs lower their cohorts’ salaries and displace high school graduates and also lower their wage demands. 6. An afterthought, but anti-immigrant backlash would tend to lower their wages and have a ripple effect on everyone. 7. Many notable economic theorists, from Adam Smith to Marx and beyond, have given plausible theories of wages that didn’t rely on macro supply and demand. Most assumed the obvious, that employers have greater control of wages even when unemployment is low. Going against this common sense notion, economists insist labor is like eggs, or books, or cars, and prices reach an equilibrium of sorts. Maybe those economists should pretend they are an average Joe looking for job or they will starve, and then see how wages are fixed. My tone may be too strident, as in where do I get off copping an attitude that I know better, or belittling the obviously considered research presented, even if it comes up short, or is wrong. In my defense, perhaps the very fact that labor conditions are so bad, more than a million prime age workers dropped out, indicates a worse situation than if just those million stayed in and were merely unemployed. This kind of makes sense. Which labor market is worse, one where unemployment is 5.2% or one where it’s 4.2% because a million prime age workers gave up hope of ever finding work?